This article was adapted from the SONAR Gloucester Update PDF. Open the Cakewalk Command Center, then download the core SONAR Artist, Professional or Platinum category. Platinum users will also see an update for the Cakewalk Drum Replacer. Please note that Command Center 1.1 was introduced during July; please update to the latest version if you haven’t already done so. Read the full story on the Cakewalk blog. Available on the Cakewalk blog. SONAR now handles project templates and creating new projects with much more flexibility— which gets you making music faster. It’s no longer necessary to save a special normal.cwt template. When you choose File > New to open the New Project dialog box, you can click on any project template, then click on Set as Default Template. This places an asterisk next to the template to remind you which is the currently chosen template. You no longer need to name a new project before proceeding. If you don’t provide a name, project audio data storage defaults to the global audio folder. 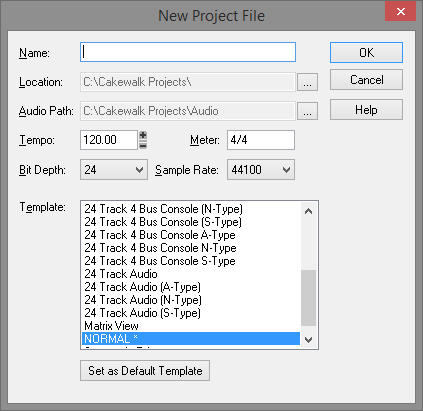 When you later save the project, you can specify a different audio folder in the Save As dialog box. If you provide a project name, although the Location and Audio Path fields will populate automatically with recommended paths based on the project name, you can change the paths as desired. When you start a new project from a template, you can specify the project’s Sample Rate, Bit Depth, Tempo, and Meter. You no longer need to change these after starting the project. The Gloucester fixes and workflow enhancements are available in their own knowledge base article.